Marijuana on display at a dispensary in Las Vegas. This neighborhood ain’t big enough for the both of them. Two marijuana companies, one from Arizona and the other with local owners, are applying to open dispensaries on the same block of Hyde Park Avenue. But Boston’s zoning rules prohibit licensed cannabis businesses from opening within a half-mile of one another. So who stays and who goes? City Hall isn’t saying. As frustration mounts among marijuana entrepreneurs, the City Council has called a hearing to gather feedback and press the administration of Mayor Martin J. Walsh on its process for selecting applicants. A top concern for a number of councilors: prioritizing firms owned by Boston residents, especially those from minority neighborhoods where disproportionate numbers of people were arrested for marijuana crimes before the drug’s legalization. To open a marijuana shop or other licensed business in Boston, prospective operators must hold hearings with neighborhood groups, get buy-in from the area’s city councilor, submit an extensive local application, negotiate a host community agreement with the city, and win approval from the Zoning Board of Appeal — all before winning a state license, too. But like many other Massachusetts municipalities, Boston has yet to spell out its process or criteria for choosing between applicants whose proposed locations are in conflict under the half-mile buffer zone rule. Most cities and towns have similar buffer zones. But Walsh’s administration has also not said whether Boston will join Somerville and Cambridge in waiving them or otherwise prioritizing companies owned by local residents or participants enrolled in state Cannabis Control Commission programs meant to boost entrepreneurs from — and companies that serve — communities with high rates of drug arrests. Municipalities routinely give preference to certain groups when awarding contracts — for example, minority-owned construction contractors — though the legality of doing so among marijuana license applicants at the local level remains untested. Advocates are frustrated with Boston’s large buffer zones and slow, opaque selection process. They say the system favors large, wealthy, and well-connected operators who can afford to hire former City Hall insiders to smooth the road and quickly scout out properties in eligible areas. And they say the problem is urgent, as big businesses are already snapping up leases and properties in prime locations. Marijuana entrepreneurs, too, are fed up, though few would say so on the record for fear of alienating the Boston officials whose approval they need. City Councilor Kim Janey said her office had been contacted by local companies unable to get answers from City Hall. “I’m very sympathetic to the frustration that some companies are already out of the gate and that, even though there’s some good language in the [state regulations], there’s the potential for people to be left behind,” Janey said. 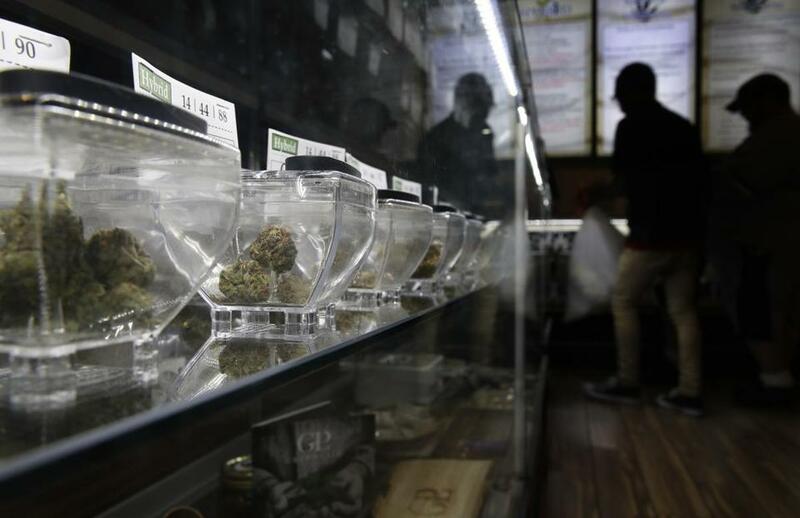 Attorneys for cannabis operators acknowledged they have little insight into Boston’s process, which is managed by the city’s director of emerging industries, Alexis Tkachuk. 4Front represents Evergreen Farms, the locally owned company seeking approval in Hyde Park. The firm has completed its application and required hearings, as has its rival for the area, Arizona-based Harvest Group. Sean Berte, a Roslindale native and consultant to Evergreen whose wife is a co-owner of the firm, said there’s nothing to do now but wait and worry. But he hopes that when the city decides, it will give points for his family’s longstanding ties to the area, saying that locally owned companies would keep profits in Boston and be more accountable to nearby residents. Adam Fine, an attorney for Harvest Group, defended Boston’s rolling selection process, saying it places a strong emphasis on feedback from neighbors and community groups, giving residents a chance to decide whether they prefer a particular locally owned group or a more experienced out-of-state operator. The state cannabis commission, meanwhile, is collecting feedback on draft guidance that would encourage municipalities to set up more flexible buffer regulations and to waive some requirements for locally owned companies or those participating in the state’s equity and economic empowerment programs.